“Investigators took biopsy specimens that were 6 mm in diameter from the nasal septum, under local anaesthetic. Then they grew the harvested cells in the lab for two weeks. The cartilage grafts were further prepared and then cut into the right shapes. Finally, surgeons used the engineered grafts to replace damaged cartilage that was removed. ..Even though the level of repaired tissue appeared to vary among patients and over time, MRI scans at two years showed new tissue developed with similar properties to the original cartilage. The nine recipients reported improvements in use of their knees and better pain scores compared to before their surgeries. Heads and Knees – Check! Shoulders and Toes just around the corner. The bad news about Johan Djourou’s knee means that he is going to be out of action for around 6 months. I suspect the problem with Johan’s knee is an osteochondral defect, I shall try to explain this to those of you without the medical knowledge. An osteochondral defect means an area where the smooth joint lining, the cartilage, has been damaged, this is different to the meniscus of the knee which is the cup shaped bits which are made of fibrocartilage. If Johan had torn his meniscus then one would expect him to have it tidied up with key hole surgery and he’d be back relatively quickly. Either he is having a repair to his meniscus which would take a lot longer to get back to football from, or he has an area of damaged cartilage, an osteochondral defect. There are different treatments for osteochondral defects and none of them are perfect by any means. One can try to regrow a sort of cartilage in the hole by ‘microfracture’ treatment, one can transplant cartilage from the patient or from elsewhere, plus there are some emerging stem cell treatments. All require a substantial period of rehabilitation to allow the new cartilage to bed down as it were. Good luck and a speedy recovery Johan, it’s a shame to lose such a talented young player when he was showing such signs of developing into a very solid centre back. via Another Arsenal Blog: Djourou shocker, honest Wayne and BBC inadequacy. ScienceDaily (Apr. 2, 2009) — A new study finds previously unidentified fibrocartilage-forming progenitor cells in degenerating, diseased human cartilage, but not in cartilage from healthy joints. The research, published in the April 3rd issue of the journal Cell Stem Cell, provides valuable insights into the reparative potential of cartilage and may lead to development of regenerative therapies for arthritis. via Diseased Cartilage Harbors Unique Migratory Progenitor Cells. A number of methods have been used to repair of cartilage damage. The first is osteochondral transplantation, which involves taking a plug of cartilage from a non-weight bearing area and placing it into a defect in a weight-bearing region. The second is microfracture. In this procedure, a surgeon will drill a number of small (2 mm diameter) holes into the cartilage until bleeding from the bone marrow occurs. The theory is that stem cells from the bone marrow will “leak out” and heal the cartilage damage. The final method is the use of autologous stem cell implantation with or without the assistance of a scaffold matrix to hold the cells. The problem is that all these techniques have been used to treat focal cartilage lesions and not osteoarthritis. Also, recuperation from the first two procedures (chondral plug and microfracture) is exceedingly long. 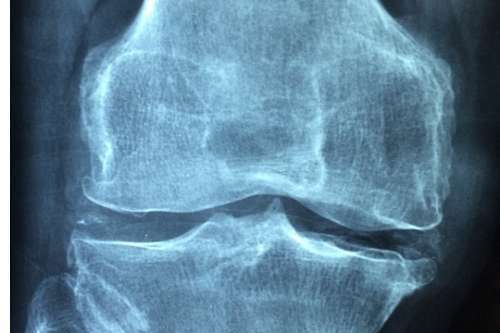 Osteoarthritis lesions are generally large and unconfined and as a result may not hold onto chondrocytes (early cartilage cells) long enough for them to repair the damage. Of the three methods described above, the one that seems to be garnering the most interest lately is autologous stem cells. Results from a number of uncontrolled studies seem to show that stem cells can be harnessed to repair and possibly regenerate cartilage damage in OA. There are three types of stem cells that have been used in research. The first type is embryonic stem cells. These have the advantage of being the cells that probably can grow the quickest. Unfortunately, there is the theoretical possibility that there might be unregulated growth, ie. cancer. Also, some have raised ethical concerns. The second type is donor mesenchymal stem cells. These are cells that are obtained from a human volunteer, and then grown in a lab. They have the advantage of numbers. The concentration of stem cells can reach anywhere from 20-50 million stem cells. The disadvantage is the possibility of rejection reaction and also the possibility of transmission of infection. The final type is autologous stem cells. These are cells harvested from the patient. A large amount of bone marrow is aspirated from the iliac crest of the hip. The bone marrow is then concentrated using a special technique in order to obtain the stem cells. via Health And Fitness | More About Stem Cells and PRP For Osteoarthritis :: By Nathan Wei | BharatBhasha.com. Back in December 2003, re:search reported on the work being done by Anthony Hollander, Professor of Rheumatology and Tissue Engineering in the Department of Cellular and Molecular Medicine, who was pioneering regenerative medicine techniques in order to replace cartilage in the knees of osteoarthritis sufferers. Five years later, re:search reviews the remarkable developments that have occurred in that time. Building on his previous work, Hollander and his team, which included Dr Wael Kafienah and Dr John Tarlton, announced in 2005 they had, for the first time ever, successfully grown human cartilage from a patient’s own bone marrow stem cells. It took just over a month to grow the cells into a half-inch length of cartilage and tests showed that the laboratory-grown cartilage was of a higher quality than any previous attempts at tissue engineering. Now the challenge was how to implant the engineered cartilage into the knee and get it to integrate with the surrounding tissue. The idea was to use cells to drive integration of one tissue with another, with the long-term aim of developing a way of fixing and integrating engineered cartilage with natural cartilage, literally ‘knitting’ the two surfaces together with cells. via Bristol University | News from the University | A stem cell bandage for your knee.